We have been receiving many requests for new ViSalus™ Vi-Shape Shake recipes. As our valued customers already know, we send our amazing ViSalus™ Vi Shape Recipe Book free of charge to all new Challengers so they have the tasty shake recipes when their order arrives. Purchase Vi-Shape in our Web Store and receive the recipe book free. We offer creative recipes with healthy ingredients that are easy to make. Here are a couple new Shake Recipes that were recently shared with us…and, just in time for the holidays!! Lose weight with these delicious shake recipes. We regularly post new shake recipes on our Facebook page, so Like us on Facebook! Check out this Vi-Shape ‘Mint Chocolate Chip’ recipe! A delectable treat for mint and chocolate lovers! 2 drops of mint flavoring …. Blend and enjoy! Chocolate Chip Cookie Dough Vi Shape Recipe anyone? Yummy!!! 3 ice cubes blend and enjoy!! A Winter Time Favorite! 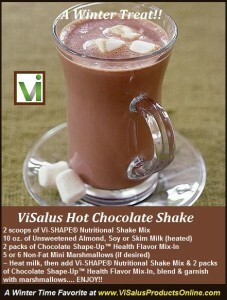 ViSalus Vi-Shape Hot Chocolate Shake recipe! ~Heat milk, then add Vi-Shape shake mix and Chocolate Health Flavor Mix-ins, blend and garnish with marshmallows…Enjoy!! We will send you a free Vi-Shape™ recipe book when you buy from us. Visit the Vi Online Store today!